Running The Race Before Us: Bring on the ice cream!!! Bring on the ice cream!!! It all started this weekend when I realized that the necklace I bought to remember the baby we lost - a forget-me-not necklace with gemstones that hang off it to mark the month the baby was conceived and then the month the baby was lost - this necklace has STILL not arrived in the mail yet! I ordered it not long after the first of the month. I had even received an e-mail saying that it was in the mail on the 18th. Well, it's the 29th. Ten days to ship a necklace?! I don't think so! So, I've e-mailed the company, but of course it says on their website that it could take up to 9-14 business days to get to me. However, I've bought things online before - all the websites say that - but it never takes THIS long to get to me! I just WANT IT! I lost the baby; I don't want to lose the necklace too! Then... I've got this vase. It was filled with flowers that work had sent me when I was at home recovering from the miscarriage. It was one of the few things that made me smile that week. Well, the flowers are dead :-( So, I decided that I wanted to fill the vase with... you guessed it... forget-me-nots. It would be a nice tribute to have around. So, I went to Michaels not too long ago to get some forget-me-nots (the plastic kind that do not die) only to have the sales lady tell me that they aren't in season right now so they don't carry them :-((( Which means I'm going to have an empty vase until spring. EMPTY - like my womb right now. I just want something more to remember the baby. 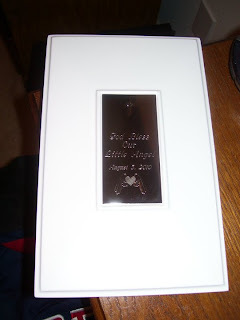 We did buy this nice box that has the baby's ultrasound pics in it. I light a candle next to it almost every day. It makes me feel better. But I need more right now. After going to find out of season forget-me-nots didn't work, I went to the christian bookstore in search of books on pregnancy loss - and found NOTHING. Goose egg! Then I went to Books-A-Million. And I know there must have been something there, but I couldn't find it. And I wasn't about to ask a sales clerk, "Hey, do you know where the books on miscarriage are?" FORGET IT! I wandered down the isles searching for something, anything I could maybe read and get comfort from... then I stumbled down the baby book isle... and got really dizzy. So, I left there, and went to Wal-Mart. I got my Ben and Jerry's Chocolate Brownie Chunk ice cream! And now, I plan on emotionally eating the entire pint! I can do it, too!! While contemplating writing a book about miscarriage, cause it makes me mad that the christian book store had nothing there. Jamie, I had a similar situation getting my necklace to remember our angel baby. First I ordered a bean (ya know cause that early the baby only looks like a bean). Well it was ugly and I returned it. Then I ordered a forget-me-not necklace. The package arrived late, beat up and with no necklace. The site I ordered it from finally sent me a replacement. But it took well over a month. The necklace was a great help, but I find I don't wear it much anymore. Hearing that a bookstore has nothing on loss makes me so sad. I hate that it's such a taboo topic that people don't talk about it! I'm on the hunt for some books for you that come recommended by my mom friends who've also suffered losses. And if you need recommendations for some Etsy sellers who will work with you to custom design something in the event that this necklace doesn't pan out, let me know and I'll find that for you, too. Miranda - Thank you so much for looking into the possible titles. I was so bummed when I couldn't find anything! Also, if that necklace doesn't work out, I'll let you know! A friend told me about your blog because I have been through two miscarriages this year. After our first miscarriage, a friend gave me a book called "Grieving the Child I Never Knew" which my husband and I went through together. Very helpful! I also just finished a book called "I Will Carry You" by Angie Smith. You may want to wait a little while to read this one though. It's a tear-jerker! Both are Christian books. I pray you will allow God to help you grieve in a healthy way.